ZAIM　横浜創造界隈【ザイム】 - ACCESS . . .
2 minutes on foot from Nihon-odori Station on the Minato Minari line. 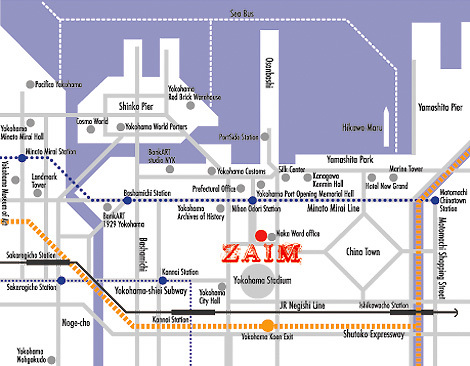 5 minutes on foot from Kanai Station on the Negishi or the Yokohama-shiei Subway lines. From Shinagawa or Daisan Keihin Expressway: use the Shutoko Expressway Yokohane Line. Take the Yokohama Kouen Exit. From Shutoko Expressway Wangan Line use the Kariba Line. Take the Yokohamakouen exit. From Tomei Expressway change to the Hodogaya Bypass bound for Yokohama at the Yokohama-Machida interchange. Change to the Kariba Line at the Shinhodogaya interchange. 5 minutes from the Bandobashi Exit. OPEN: 10am - 10pm daily.